If you're new to fly fishing, you may wonder what stripping baskets are and why you need one. It's very simple. This is a basket to keep your excess fly line controlled. Instead of drifting in the current, tangling around your feet or around rocks in the water, the basket keeps your line safe and ready to immediately follow your fly out over the water. After spending hours untangling your line over and over again, you'll be thankful to find a good stripping basket. Depending on how and where you fish, you can use any number of things for a stripping basket if you don't want to buy one made especially for the task. If you fish from a boat, you can use just about any basket you can keep in place with your feet. You can even buy stripping basket inserts to affix inside so your line doesn't get tangled. An insert is plastic and looks like there are rows of cones built into it. Some people using a boat in saltwater, going for the larger fish, actually use collapsible leaf baskets that are weighed down on the deck. If you're wading in the river, it may benefit you to buy one that is specially made for the purpose of holding your excess line. In fact, these baskets began with saltwater fly fishermen, since they needed so much line to cast. 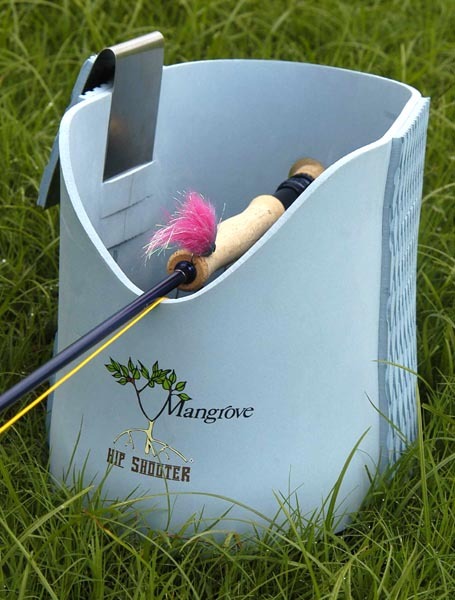 Now many freshwater fly fishermen are giving these baskets a try, and they are gradually being won over. These baskets range from about $20 to $75. There are many styles to choose from. Several companies make a mesh bag. The good thing about the mesh baskets is that they flatten and fold up when they aren't needed. This makes it easier to hike through tight spots to reach your favorite fishing hole. Some actually fold up into a wading belt. Others have larger mesh so they are not at the mercy of the wind. Some fishermen really like the mesh, especially for stream fishing. Others find them unstable and without the cones to prevent tangling, they have problems keeping their lines clear. The mesh baskets are lightweight, however, and it is easy to see around them when walking in water on unstable footing. A variation on the mesh basket is part mesh, part fabric. This basket is deep enough so your line doesn't fall out or blow out from the wind, yet it is shallow enough that it doesn't eat up your line when you try to cast. It also packs away when unneeded, making for a very convenient basket to have on hand. The mesh bottom lets excess water drain away. Another new design is made of soft foam, so it collapses as needed. It is soft and comfortable to wear around your waist. The basket can be used by either left or right-handed fishermen with ease. A scooped out side makes a great place to rest your fishing rod. 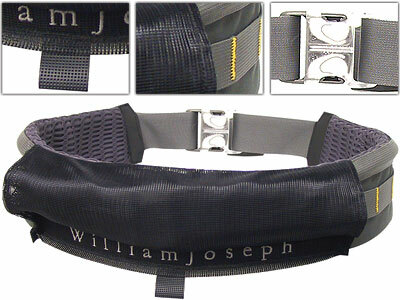 A stainless steel clip makes it easy to attach to a wading belt or remove it when you don't need it. Line coil separators line the bottom of the basket to keep your line from tangling. 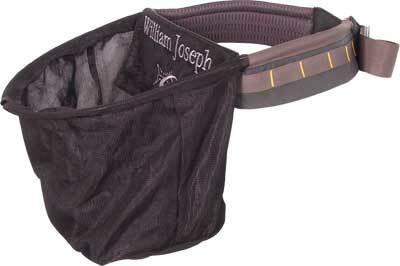 A traditional form of basket attaches to your wading belt and is formed of hard, rugged plastic. You can find them in both rectangular and rounded shapes. Molded to fit your body, it is fairly comfortable to wear. Plastic spikes are molded into the basket to keep your line from tangling up. It is durable and will last for years. Molded indentations on both sides make a perfect spot to rest your fishing pole. There are a couple of companies that make this style, and you may end up paying more or less depending on the label. Whatever variety you try, it will save you hours of dealing with tangled fly line so you can enjoy your fishing trip more.